"Stel and I have to be tight to form the backbone of the songs," begins drummer Ben Byrne's explanation into how Starsailor create their live sound. "Jim then plays his rhythm guitar parts over the top of that. "At the same time, Barry 'Magic', over to my right, is adding whatever he feels like on the top with his keyboards and organ." The wizard he is referring to, of course, is Barry Westhead. Hard to see when the band have a second guitarist on stage (as will be the case next week when Embrace's Richard McNamara joins them in Sheffield, Newcastle, Edinburgh and Aberdeen), and not somebody demands a spotlight or two to be shone in his direction during any show, it's easy to overlook his contribution. But watching him during Friday's show in Southampton's Engine Rooms, a venue situated somewhat surprisingly on an industrial site near to a John Lewis and Ikea, but one that was far more conventional inside, not to mention packed and really hot come 10pm, was a revelation. No more was this the case on the night's big surprise, and arguably the highlight of the evening, during "Love Is Here", the second tour premiere since show one five days ago (out went “In The Crossfire”). 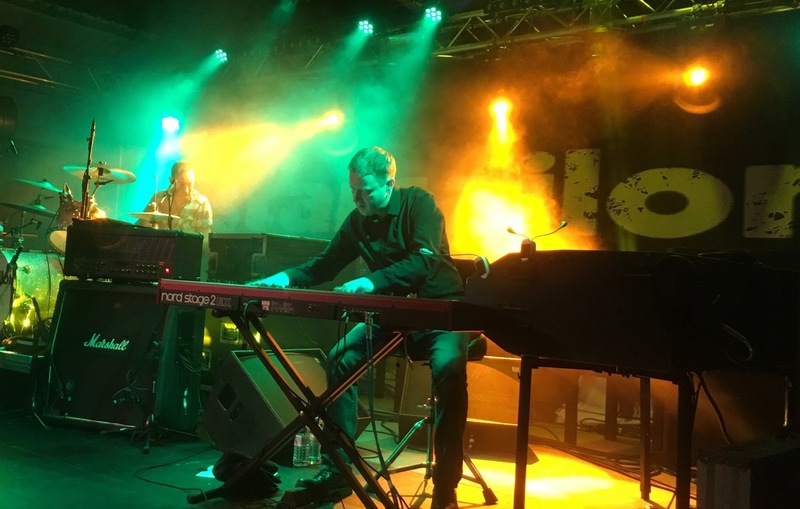 Stretching across to play on both his Nord keyboard and Hammond organ throughout, his right foot tapping away to the beat, Westhead's playing was stunning and perfectly complimentary of what the rest of the band were doing. The song's outro, in particular, was flawless, the lively Southampton crowd loved hearing it, as I suspect every other audience will at future shows, should it stay in the set. His straightforward, chord-led organ parts during “In My Blood” and “Fever” are easy to pick up both on the record and during live shows, but if he repeated his more subtle keyboard work from Friday night's gig on the piano situated in the middle of London's St Pancras station, he'd probably end up being filmed by a member of the public and would go viral. “Honestly, when the band took a break in 2009 [to 2014], my playing went to s**t,” Westhead admitted. “I wasn't playing live, I was busy at home, so I didn't practice. Over time, you lose what you've learned. The last part of Westhead's comments also applies to Southampton, too. Lead singer James Walsh referenced how sweat-inducingly hot it was inside the Engine Rooms when he praised the crowd for “making it so energetic” despite the temperatures, before leading into “Tell Me It's Not Over” with a claim that he was going to “attempt to jump up and down and go for it during this next song". Yet, undeterred, the crowd stayed on it all night. Santa hats were spotted in the front row, some got caught up in the moment and the music, while others snapped away on their iPhones in an attempt to get as good a photo as possible to remember the night by. Friday's audience certainly generated the loudest singalong to “Alcoholic” that I've heard on this tour, and their “WOAH!” during each choruses of “She Just Wept” and “Keep Us Together” sounded just as good. Regardless of whether the day of the week it was, and the proximity to Christmas helped in their willingness to participate, they've raised the bar. Norwich and Nottingham, over to you. Musically, you'd be hard-pressed to argue a claim for when the band were playing better night upon night during their entire career. It's too tough a call to split their performances in London and Southampton, but neither crowd were shortchanged. Sporting a trimmed haircut from earlier in the day, James once again led from the front, covering all parts of the stage during his singalongs and solos, but the other three members were also on form. Musicians in being human shock. But that's what it's all about, and why nearly 1,000 people left the Engine Rooms on Friday evening after a 17-song powerhouse set, after 90 minutes of joy, anger, desperation and camaraderie. You get all these emotions just from watching Barry. He adds to the beauty of “Boy In Waiting”, the anguish of “Tell Me It's Not Over” and the drama of “Tie Up My Hands”. Watching him throughout the latter, a song crowds up and down the UK seemingly love more each year, at times he played with both his eyes closed, seemingly lost in the music, but not missing a beat. That's the Barry Magic right there.